Image caption Vladimir Putin said a tribunal would be "counter productive"
Western nations and Ukraine say there is evidence it was hit by a Russian-supplied Buk anti-aircraft missile - a claim also denied by Russia. Malaysia pushed for an international tribunal to try those responsible. The move was backed by the Netherlands - which had 196 nationals on board - Ukraine, Belgium and Australia. Moscow has blamed the government in Kiev for the disaster. Speaking earlier this month, Russian President Vladimir Putin said that the establishment of a tribunal would be "premature" and "counter-productive". Russia exercised its veto at the Security Council session in New York during a vote on Wednesday, while 11 other members backed the draft resolution. Angola, China and Venezuela abstained. "Russia has callously disregarded the public outcry in the grieving nations," said Samantha Power, the US ambassador to the UN. Australian Foreign Minister Julie Bishop called the Russian veto "an affront to the memory of the 298 victims of MH17 and their families and friends". She said Australia, Malaysia, the Netherlands, Ukraine and Belgium would seek an alternative prosecution mechanism, without giving further details. Ukrainian Foreign Minister Pavlo Klimkin said: "There can be no reason to oppose this [draft resolution] unless you are a perpetrator yourself." Russia's envoy to the UN, Vitaly Churkin, defended his country's actions, saying any criminal prosecutions would have been carried out in a "closed fashion". 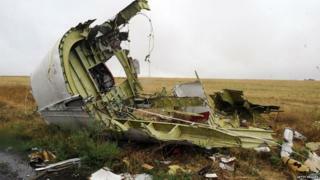 He also criticised "aggressive propaganda" and said Russian investigators had been denied equal access to the crash site. Moscow drafted an alternative resolution that did not include a tribunal, but called for a full international investigation. Malaysia's transport minister had urged council members to vote in favour of a tribunal, saying it would be best placed to "deliver justice to the families of the victims". A final report on the cause of the crash by the Dutch Safety Board is due to be released in October.